Farthingale 1, per Simplicity 8881 – I’m pretty sure that I made every possible mistake trying to put this together. Cutting the panels, I didn’t mark the placements for the casings, so I had to meticulously match and mark by pencil after the panels had been sewn together, and the seams had been finished. To keep the order for the panels, I numbered them in pencil in the seam allowance and stood by my decision since no one will see the under-bits. I must have missed the part about needing grossgrain ribbon for the waistband. Luckily, cheerleading has made me an unwilling hoarder of ribbons in all colors, sizes, and weaves. I had just enough white and orange in almost the right width. I planned on the facing being white, but I managed to have orange facing at about midnight–thank you, exhaustion. The pattern called for hoop steel, which is what I ordered. I tried a variety of sizes and types of wire cutters, snips, and scissors to get through what I thought was a small amount of steel. I’ve attributed the first cut to luck: I managed the right combination of cuts to get my first hoop the right size, undamaged. The second trial, however, was only successful in that no one died in the end. Long story short: by a lucky coincidence, my brother showed up with his metal working bag of tricks and cut the second length of steel without setting the cloth ablaze. *The sparks were beautiful against the white cotton muslin that I picked up. * After inserting the hoop steel in the top casing and getting stuck in every seam, I took a tip to sew the remaining casings on the outside. At some point between starting and finishing the steel insertion, I realized that no one should be given the opportunity to critique this endeavor (no points for neatness). My main concern then became the hemline–it will be a work in progress for as long as the farthingale is in one messy piece. Enough said. 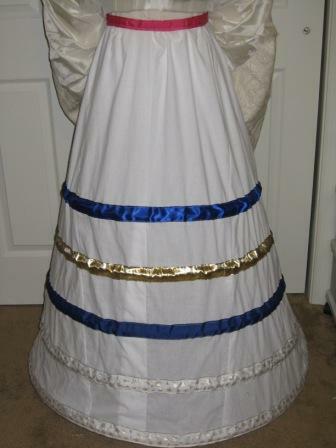 Farthingale 2, per Margo Anderson- The rings were sized down for an existing [under]dress. 2/15/09 – I don’t care for math…I do it, but I don’t care for it at all. I won’t bore you and embarrass myself with the agonizing details of how I got to a working set of numbers for this monstrosity. Suffice it to say that this will be a custom fit. Originally, I wanted to try some spiffy fabric combination that would make the farthingale pretty and functional, but “ye old local fabric store” was having a serious sale and I got distracted, forgetting my primary mission. Oh, well. I’m using the rest of a bundle of white cotton (see farthingale #1), polyethylene tubing, and a mix of ribbons from my cheerleading stash. I’m considering an attached cover/petticoat that will hide the mish-mash of colors and help conceal the ridges from the tubing. 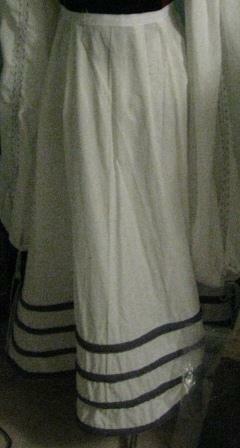 Since the farthingale is being made to fit an existing dress, I only had the bottom hoop measurement to go on. I got that by opening the dress hem and inserting tubing until I reached the appropriate fullness. I want this to be more of a traveling dress; something that I can easily navigate through the faire in. To achieve the right lines(*crosses fingers*), I decided on five hoops, four inches apart–it will resemble the Spanish farthingale in The Tudor Tailor, rather than the Alcega diagram in Patterns of Fashion. At this point, I’ve made what I believe are the appropriate corrections to fit the bottom hoop. I took in the front three inches at the bottom, narrowing to the existing waistline at the top. I’m currently getting the casings pinned on. Post completion update – Well, it’s done, and that’s something. Once the casings were on (one nightmare of many), the tubing went in fine. I used the corresponding hardware connectors, which I expected would bulk up the lines in the back of the gown, but you can’t really tell…mostly because the fabric is so bunched up around the rest of the contraption that it blends into the confusion. At some point, I considered covering the outside in a pretty fabric, but I was so fed up with the whole thing that I decided against it. Farthingale 2 is frustratingly hideous to me, and it does not compare to the first one, which I now consider to be a masterpiece. I like the tubing, which is holding shape well in a bag in the closet. My concern with the tubing will be how much it shows through its overskirts. If I need another farthingale…ever…I may stick with the tubing, putting it on the inside attached to an inner layer of two total layers. When I return to the project for which F2 was designed, I may have to make some corrections, but I don’t really want to look at it anymore, so I won’t. In my half-hearted attempt to achieve an Italian impression, I decided that I needed something to keep my gown from getting tangled around my legs without using hoops. The skirt is the Margo Anderson underskirt in white cotton. 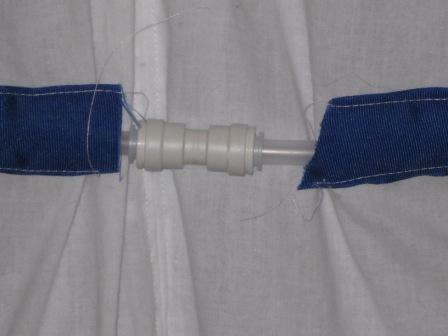 I made channels from cotton/poly bias tape (thanks again, remnant bin), placing one full circle at the bottom, and making a second channel in a spiral, spaced 2 inches between each row. That technique (with varied spacing and height) is used by many costumers, it would seem, so I won’t attempt to credit one person or another. I used a cotton clothesline for the cording. To my surprise, sewing down the channels and threading the cording through them wasn’t the bear that I thought it was going to be. Pinning the channels down was monotonous, but not awful, and well worth the time that it took. I will absolutely do another one of these, but I plan to use a more interesting fabric, with ONE complementary trim for the channels. I ran out of gray on the last spiral, so I switched to brown, since it was unlikely that my gown would get up that high. On the next one, I will also decrease the space between rows. Two inches isn’t useless, but I wouldn’t mind a heavier petticoat, as strange as that sounds. ROFL. Sometimes no one died is an accomplishment. I have had that exact response from time to time with one or another insane projects I’ve embarked upon, and so got a very long laugh from that comment. Thanks for the write-up!